The Ladakh Autonomous Hill Development Council (LAHDC) has decided to adopt an insignia similar to the national emblem by replacing the Jammu & Kashmir's logo, drawing a sharp reaction from Peoples' Democratic Party (PDP) which said it was "unfortunate. 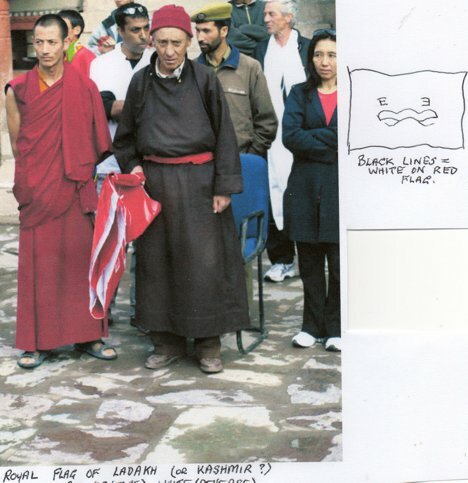 Although in this article is not mentioned, searching for this material I read several articles that says that also a flag for Ladakh bearing the new emblem was hoisted. There are two Ladakh Autonomous Hill Development Councils - one for Leh (which has an emblem/logo not containing Jammu & Kashmir emblem in it) and the other Council is for Kargil (which used, apparently, J&K emblem until now and there is a lot of articles about the change, but not even a single image of it). A photo of the old Ladakh Flag or Royal Flag? This is a 2 coloured flag of white (reverse) & red (obverse), on the red part is the Ladakhi emblem, drawn in white - as indicated by my drawing. I have been searching for flags from the Tibetan cultural area for some years now. I can say that if they are quite rare for Tibet itself, they are still rarer for others old kingdoms and principalities which are now parts of India or other countries (even for Bhutan, which is the last independent and organised country of the area). Locals may well have had rich vexillological traditions for several centuries, but if so they generally don't write nor talk about them. As for this flag, the same photograph can be seen on the travel blog Kunzum with the following caption : "The King flagging off the Ladakh marathon". So, I wonder if it could be some sport flag used by the king on this occasion. The "E" letter you have seen on this flag is the "jha" letter of the Tibetan script. The Ladakh Scouts have a flag. It seems to be green and shows a golden device on its center. It is a golden wild goat (or ibex) on a pedestal, probably the same as the regimental insignia. Above it are the words (still with golden letters) Ibex thrillers, and under it the name Ladakh. The Ladakh Scouts were originally a paramilitary unit, but became a real regiment in 2000.